The current shift from Preventive to Condition-Based Maintenance (CBM) deserves some reflection. Until recently, CBM required the implementation of costly monitoring equipment and skilled technical analysts to be effective, limiting its application. The development of low cost machine condition sensors coupled with artificial intelligence is disrupting the industry and re-writing the rules of maintenance regimes. Routine maintenance has been performed on industrial equipment since the first mass-produced machines were developed in Britain during the Industrial Revolution (1760-1840). Reactive maintenance simply involves fixing problems as they occur, which will necessarily include occasional catastrophic failures, some of which could be serious enough to impact one or more other nearby machines and thereby cause serious unplanned downtime. 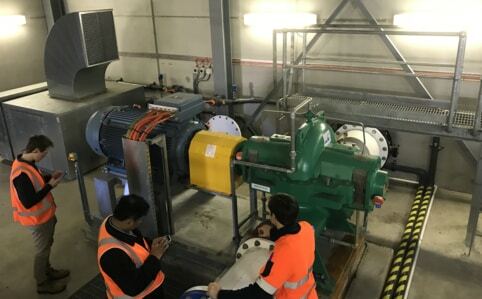 Preventive maintenance involves taking maintenance actions on a time – or utilised – hours basis, with the aim of minimising machine degradation which would otherwise shorten the operating life of the machine. Activities such as routine inspections and adjustments, oil and oil filter changes, and replacing parts that are known to fail after a set period of use are typical of preventive maintenance regimes. Condition-based maintenance on the other hand involves monitoring the condition of equipment in such a way as to detect the onset of degradation, allowing maintenance to be undertaken to pre-empt the identified degradation and return the machine to optimal condition. Reliability-centred maintenance goes further than CBM in that it uses a structured approach to the maintenance of all machines at each site, determining the importance or criticality of each component of each machine, analysing their failure modes and frequencies, and then determining the most appropriate maintenance regime for each. Large organisations often have a wide range of equipment and applications, and typically implement one or more of these maintenance regimes according to their needs. Some, for example, will have many mission-critical machines that incur very high costs for any downtime, whilst others may have very few or none. Nevertheless most organisations will implement one or more of these traditional maintenance styles in order to meet their specific business objectives, often facilitated by a Computerised Machine Management System (CMMS) which manages the company’s asset base and its various maintenance regimes. The recent development of low cost remote machine condition sensors and platforms addresses these drawbacks by re-writing the traditional rules of what type of maintenance is necessary and cost-effective for most machine types and situations. For example, installing sensors on a rooftop HVAC cooling tower would reduce the frequency of risky routine health and safety and maintenance inspections, as well as the need to turn off the whole HVAC system to render the fan safe. The development of low cost wireless sensors and artificial intelligence (AI) algorithms has enabled the development of systems such as the MOVUS FitMachine, that can replace the traditional, but far more expensive, predictive maintenance systems (known as SCADA). SCADA systems typically use a network of specialised sensors and complex machine data analysis software supported by a team of highly-specialised reliability engineers to predict when machines need maintenance. FitMachine on the other hand, uses advanced AI methods to analyse and display data – on an easy-to-understand dashboard – including the level and trends of important machine health parameters such as vibration, acoustics and temperature. Machine alerts are then sent by email or SMS message directly to the appropriate maintenance staff for action as required. The maintenance of machines at remote sites will especially benefit from this new technology by reducing the need for maintenance staff performing routine inspections to travel long distances, and/or to access machines in hazardous locations such as rooftops and contaminated and confined spaces. These new remote machine monitoring sensors and platforms are significantly disrupting the maintenance methods that have been used throughout industry for decades, if not centuries. This disruption is affecting the way that maintenance on all kinds and sizes of machines is carried out, and the skills, location, and numbers of maintenance staff needed to do this kind of maintenance, as well as the type and level of risk to which they are exposed whilst doing so. The result of this new paradigm will be that machine uptime and useful life will increase, whilst maintenance costs and associated outages will fall. Managing the transition through such a disruptive shift can be challenging, but MOVUS is making this process far easier by working with major CMMS vendors to ensure that our customers can transition easily from traditional to best-practice condition-based maintenance. A key element is our Application Programming Interface (API), currently allowing CMMS systems to receive machine health data from a network of FitMachine sensors or from the centralised MOVUS Dashboard. Once this has been achieved, and FitMachine sensors are fitted on each machine and undergo a short AI ‘calibration’ period where the system ‘learns’ the machine’s condition, MOVUS customers are able to reconfigure the CMMS to transition each monitored machine to the new CBM paradigm, and reap the benefits of a best-practice maintenance regime.